Southeast Asia is facing headwinds in the face of the US-China trade war and increased global market volatility - read here how the region is coping. The US-China trade war has a moderate impact on Southeast Asia, but strong domestic demand and countervailing policies support GDP growth. Increased risk aversion in international financial markets is felt by those countries with current account deficits, but strong economic fundamentals make a financial crisis unlikely. Some weaknesses still exist, making these economies vulnerable to the stronger US dollar and higher interest rates. For many years, the emerging economies in Asia have been the main growth engine of the world economy. Next to the big economies of China and India, the Southeast Asian countries have made strong contributions to global GDP growth. This year, several developments give reason to be worried about the growth outlook for the region. The escalating trade war between the US and China, monetary tightening by the Fed and - in connection with this - rising risk aversion to emerging markets will leave their mark. Export growth is expected to slow over the next two years, and for some countries, it will be more difficult to finance their external deficits. Still, we are not very concerned. The impact of weaker global trade on overall GDP growth in Southeast Asia is just moderate, because domestic demand continues to be strong, there is room for countervailing macro policies and the trade war should also have some positive consequences. Regarding Fed tightening, we consider it unlikely that the bigger Southeast Asian countries will face a financial crisis because of higher interest rates in the US and less risk appetite of financial markets. Global investors are aware that in the last two decades sound macroeconomic policies have strengthened their economies. Larger buffers and flexible exchange rates are reason to expect that countries dependent on external financing can cope with diminishing appetite for their bonds and equities. The outlook for Southeast Asia has weakened, but is still quite rosy. Helpful for a change in China’s hard stance may be that the EU and Japan share the US’ concerns about close ties between state and business in China, the imposed sharing of technology by foreign companies investing in China and the absence of a level playing field in the trade relations. In addition, the way China operates in the Belt and Road countries, connecting direct investments with voluminous lending practices, meets with increasing resistance. Chances Helpful for a change in China’s hard stance may be that the EU and Japan share the US’ concerns about close ties between state and business in China, the imposed sharing of technology by foreign companies investing in China and the absence of a level playing field in the trade relations. In addition, the way China operates in the Belt and Road countries, connecting direct investments with voluminous lending practices, meets with increasing resistance. Chances are rising that the US, EU and Japan will combine their efforts to change or even combat the way China operates in the world economy. China will realise that it will be hard to keep good economic relations with other countries without some concessions to its unique economic model. Recent developments show that the trade war is escalating between China and the US, but is more or less moderating on other fronts. The US has closed deals with Mexico, Canada and South Korea, whereas the skirmishes between the US and the EU have evolved into some kind of truce. The main target of the US trade policy, China, has however fallen victim to consecutive measures by the Trump administration, and China has hit back hard. Though a global trade war does not seem to be the case anymore, the trade conflict between the US and China may have serious consequences for both global trade and the world economy. Southeast Asian countries will feel the impact because China and the US are their main export destinations, and their economies are part of global supply chains, which can be impaired by a weaker global economy. Important in this respect is how long the trade war between the two economic powers will last. The longer the trade war lasts, the bigger the impact will be. Prospects for de-escalation in the short term are low. The trade war has been instigated by a US president who firmly believes that bilateral trade deficits are bad for his country. An important reason for the US’ firmness for the longer term is that many US politicians see China’s rise to an economic super power as a threat to their country. The likelihood of de-escalation, however, may rise over time as the increasing economic impact in the US will make the Trump team less combative and China will experience more problems combining the much-needed deleveraging of the economy with stimulating measures to avoid a hard landing. Though the trade war may de-escalate in the longer term, it is worthwhile to look at the consequences for Southeast Asia. The five biggest economies in the region are all experiencing the headwinds of the US-China trade war. Lower export growth this and next year, however, is not resulting in a sharp deterioration of GDP growth in any of these countries. In fact, the export growth decline is mostly related to the slowing growth of the Chinese economy, which was underway independently of the trade war. While the trade war has just a moderate impact on economic growth, increased risk aversion on financial markets has noticeable influence on exchange rates. Several emerging markets fell out of favour during the summer, which was reflected in capital outflows and depreciating currencies. The rout started in Argentina and Turkey, countries that have made serious policy mistakes. At the peak of the unrest, both countries experienced severe currency crises, which dragged down the currencies of other countries dealing with policy uncertainty and/or external and fiscal weaknesses. The Indonesian rupiah and the Philippine peso came under pressure as well, though to a much smaller extent than many others. Unlike the other three main ASEAN countries, Indonesia and the Philippines both have a current account deficit, which together with deficits on the government budget, brings both countries in the category of economies with ‘twin deficits’, something the currency markets often respond to negatively in turbulent times. A difference between Indonesia and the Philippines is the relatively large reliance of the former on volatile portfolio investments in financing the external deficit. This may also be the explanation of the partial recovery of the peso against the US dollar in October, while the rupiah stayed weak. Foreign investors hold about 40% of Indonesian government bonds, which makes the currency vulnerable to further monetary tightening by the Fed and decreasing risk appetite of financial markets. Further depreciation of the rupiah against the US dollar and the euro is likely in the coming year. A sharp fall of the currency, however, is unlikely, since the economy is doing well and the Indonesian central bank will support the exchange rate by raising the official interest rates. Thailand’s economy is weathering the trade war reasonably well. Export growth will slow in the coming two years, but no dramatic shifts are expected as a result of the US-China trade war. Chinese import demand is cooling, but strong service exports in the form of tourism mitigate the impact on export growth. Real GDP will be supported by public infrastructure investments and private consumption, both stimulated by the government to shore up its falling popularity. More worrying are some domestic weaknesses. First, political tensions may re-emerge. Since the coup four years ago, Thailand has been under military government with little progress towards a return to genuine democracy. Divisions between the two main political groups will persist, making the danger of serious political instability an ongoing risk for international trade and investments. A second problem is the high level of household debt. Although bank lending has grown at a slower pace since 2013, households are heavily indebted. Low inflation and a large external surplus supporting the baht mean there is plenty of scope for continued accommodative monetary policy. The negative side of that, however, is that this would encourage firms and households to become even more indebted. This could result in greater financial stress when interest rates finally start to rise. Malaysia’s highly open economy is more susceptible to weaker external demand and, more specifically, weaker demand from China. Malaysia is one of the most vulnerable countries to the tariffs the US has imposed on Chinese exports. Export growth will slow, after performing strong in the first half of the year. A normalisation in natural gas production will support exports to a certain extent, but due to the expected slowdown in world trade, export growth this and next year will be lower than in 2017. Also here, the domestic economy keeps GDP growth at a reasonable rate. Household spending remains buoyant this year given the boost to disposable income from fuel subsidies and the replacement of the goods and sales tax with a lower sales services tax. The impact of these measures however will decrease in the course of next year and rising domestic borrowing rates will lower household purchasing power. The postponement or suspension of long-term infrastructure projects will slow growth in gross fixed investment. The Malaysian ringgit did relatively well this year, due to the current account surplus and the central bank’s rule that 75% of export proceeds must be converted to the ringgit. The currency, however, still is vulnerable to worsening market sentiment because, like for Indonesia, a relatively large proportion of government debt is owned by foreigners. Economic growth in the Philippines will slow gradually in the next two years, but this can be attributed only partially to exports losing momentum. After last year’s strong performance, export volume is forecast to increase a still healthy 8%. Growth in imports of goods and services will stay high, resulting in a negative contribution of net exports to GDP growth for the fourth consecutive year. Like in neighbouring countries, domestic demand is bolstering the GDP growth rate. Government expenditures will rise more than 10% because of an extensive infrastructure programme and private consumption remains strong because remittances still support household incomes. Next to net exports, the main reason that GDP growth is slowing is that fixed investment is cooling from the double-digit rates of growth posted over the past five years, due to tighter monetary policy and nervousness of investors about president Duterte’s controversial way of governing his country. Amongst the five bigger economies in Southeast Asia, Vietnam is forecast to maintain the highest growth rate in this year and next, and relatively strong export growth will contribute to that. The US-China trade skirmishes will have a negative impact on exports to China, which is the number three export destination, after the US and the EU. However, unlike the other countries, Vietnam should benefit by gaining larger market shares in export markets at the expense of China, especially in the readymade garments (RMG) sector. Vietnam is the world's third-largest exporter of RMGs and exports about 50% of it to the US. But Vietnam is in a relatively good position in other sectors as well, since almost 20% of GDP is reliant on exports to the US, whereas this is 6% to 7% for Malaysia and Thailand and just 2% to 3% for the Philippines and Indonesia. If Chinese companies decide to move production to other countries (like they did when the EU and US imposed penalties on Chinese solar panels in 2012) Vietnam is in the best position to accommodate such a shift. Domestic demand, in the meantime, will show healthy growth because of growing tourism and strong labour market conditions. Important for our assessment that Southeast Asia is weathering the trade war and increasing risk aversion of financial markets quite well is that the fundamentals of the various economies are strong enough. Before the Asia crisis of 1997/1998, most countries had current account deficits, US dollar pegs and much tighter foreign exchange reserves. That has changed. The table below, however, shows that the situation differs from country to country and that most of them still have one or more vulnerabilities. Indonesia’s dependency on external financing and the high share of Indonesian government debt in foreign hands makes the economy vulnerable during periods of declining risk appetite on global financial markets. 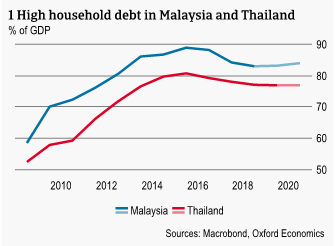 Thailand and Malaysia both have high levels of household debt, which can bring down economic growth if interest rates rise sharply. Vietnam has a weak liquidity situation and a high budget deficit (and high public debt as well). The situation however is not alarming in any of the five countries. In Indonesia, President Joko Widodo’s government has been successful in improving economic stability by reducing the burden of regulations and launching reforms to increase productivity and the inflow of foreign direct investments. Keeping the current account deficit below 3% GDP is a major policy priority. Thailand has sustainable external debt levels, a current account surplus and adequate reserves. The main weakness of the country, high household debt, seems to have peaked three years ago. Household debt has also peaked in Malaysia and persisting high government deficits developed in the right direction. Still, Thailand and Malaysia are the most vulnerable to higher borrowing costs, which may be reinforced by the risk of increasing US trade protectionism, as they have strong trade links with the US. In the Philippines, the now small current account may increase, but the country’s strong growth trend and ample foreign reserves should limit the danger of extreme financial market volatility. Vietnam shows several spots, but the vulnerabilities are decreasing. Its foreign debt as a percentage of GDP is high, but relative to export revenues it is low. Government debt has been fairly stable and well financed, with long maturities and financed by public creditors. The debt service ratio is low. International reserves are gradually rising, and the import cover is expected to reach three months this year.